Whether you currently have listings or not, getting published on our Realtor Directory is a great way to advertise yourself, your services and help build your real estate business. Walk2Shul's Realtor Directory lets visitors, sellers and buyers easily find Realtors in their local area. Visitors can use the easily accessible Realtor Search form and search for Realtors by Name, Company, Country and/or City. When you sign up and pay for your Realtor Directory listing, you will also receive your very own "Seller's Page". Visitors arrive at your Seller's Page when they click on your name on the Realtor Directory. The Seller's Page provides visitors the opportunity to conveniently see all your current listings on Walk2Shul.com on one page. They'll see your account details, including your agent photo, your brokerage name and location. An "About Me" section allows you to promote yourself, your services and specialties to potential clients. Lastly, a contact form allows visitors the opportunity to directly contact you via our internal messaging system. When a prospect fills out the form, an email will be sent to your account's email address. See for yourself by going to the Realtor Directory and clicking on one of the listed Realtors. Another feature included with your Realtor Directory listing is your own personal web address on Walk2Shul. It will look like: www.walk2shul.com/DenaKatzRealtor/ ... where "DenaKatzRealtor" can be your name, username or whatever you like. You create this personal web address when you first register on Walk2Shul as a "Realtor". You can then use your personal Walk2Shul web address in all your marketing, sending people directly to your Seller's Page, where people can learn more about you and see all your listings in one place. This is a great way to market yourself to homeowners in your area. HOW MUCH IS THE REALTOR DIRECTORY? Getting listed on our Realtor Directory is easy and affordable. At $87 per year, this is a great deal. But for a limited time only, you can lock in your spot for only $47 per year. As long as you keep your subscription active, you'll only pay $47 a year, even if we change to a higher price. So act now and get yourself listed on our Directory today. 1. If you haven't already, please REGISTER. Be sure to select "Realtor" as the Account Type. 2. Come back to this page and click the "Buy Now" button below. 3. 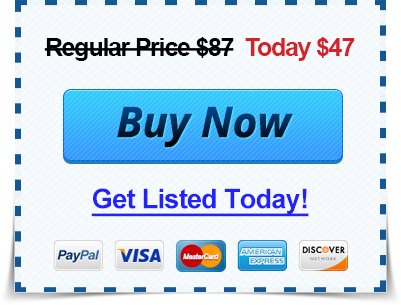 Place your order and pay for the Directory listing. Please use the same email that you used to register on our website. 4. Once we receive your order, we will activate you on the Realtor Directory and email you a confirmation. Is the $47 a yearly fee? Yes. The $47 places you in our Realtor Directory for a term of 1 year. We accept Visa, Mastercard, American Express and Discover. You can also pay via Paypal. Do you automatically renew my listing and charge me at the end of the year? Yes. Your spot on our Realtor Directory is similar to a subscription, and we do automatically bill and charge you at the end of your term. This keeps your listing current. If you decide not to continue on our Directory, you can simply cancel your original order, before your spot comes due, and you will not be charged. Can I cancel at any time? Will I receive a refund? Yes. You can cancel at any time, however all sales are final. There are no refunds. Besides the Realtor Directory, how else can I increase my exposure as a Realtor on Walk2Shul? Our Realtor Directory is a great start, especially if you currently have no active listings ... but listing properties on Walk2Shul will attract even more attention. Our Ad Packages offer fantastic value for listing multiple properties. Learn more about our Ad Packages.